Albino Luciani was born in 1912 in Canale d’Agordo, near Belluno, into a poor, working-class family. He trained at local seminaries and at the Gregorian University in Rome. In 1969-78 he was patriarch of Venice and was made a cardinal in 1973. 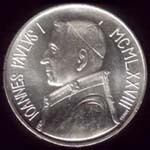 Elected Pope in 1978 as successor of Paul VI, John Paul I eliminated the traditional, elaborate papal coronation, opting for a simpler ceremony. He died one month after becoming pope and was succeeded by John Paul II.